Where rain predicts the future and light reveals the truth. 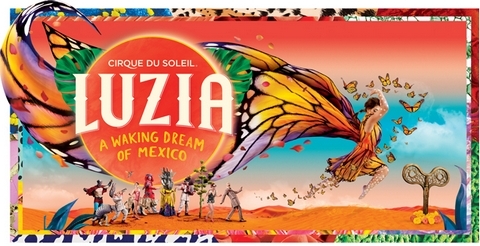 If you can imagine a Cirque du Soleil show that is creatively and freely inspired by the richness of Mexican culture in all its exhilarating spirit, then you've conjured LUZIA-A WAKING DREAM OF MEXICO. 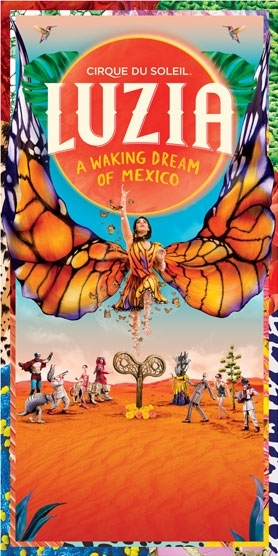 Through its set design, costumes, acrobatic performance, and music, LUZIA (loo-zee-ah), fusing the sound of “luz” (light in Spanish) and “lluvia” (rain) – two elements at the core of the show’s creation – becomes a poetic and acrobatic ode to the rich, vibrant culture of a country whose wealth stems from an extraordinary mix of influences and creative collisions – a land that inspires awe with its breathtaking landscapes and architectural wonders, buoyed by the indomitable spirit and mythology of its people - some of which may not seem connected at first glance. The key is that there is not one, but many Mexico’s. Mexico is an ever-evolving country as complex as it is diversified. It is the result of an extraordinary mix of influences from abroad over the course of many centuries. It’s easy to find images loaded with stories, colors, raw power, spirituality, wisdom, vitality, and beauty. Mexico’s culture is monumental. Its peoples have built cities of stone and great temples like mountains, seeking to replicate here on earth the architecture of the planets and stars. But it’s also the sensuality of a land where music is for dancing, where a simple song can plunge us into emotion and propels us, in tears, into the arms of a friend or loved one. There are other melodies that transport us into parallel worlds, where all of a sudden we are overwhelmed by the sonorous textures of modernity. Instead of representing Mexico in a realistic fashion, Daniele Finzi Pasca and Julie Hamelin, co-writers of LUZIA, and Brigitte Poupart, Associate Director, decided to create an evocation of this monumental country by imagining a dream woven from memories, experiences and encounters, laden with inspirations deeply rooted in the Mexican identity. But even this invented Mexico is complex and multifaceted, hence the idea of a journey – in both the literal and figurative sense – through a series of fragments, all highly meaningful and evocative. It’s a voyage into a world of hallucination, where allusions to contemporary art and age-old traditions lull us for an instant; simple encounters with the fantastical ordinary, with magical realism and with poetic reality, with the faces of men and women who surprised as they strolled through markets and across squares, traveled by bus and strolled along vast beaches from one end of this colorful country to the other. These details and more guided and led them on a surreal voyage of the imagination. Each scene then is the sublimation of a tiny aspect, an emotive fragment of this country where rain hits every town and village differently, where light is an emotional experience, where cultures overlap and nature is made up of deserts, rain forests, beaches, and mountains. The show is also based on themes such as speed, monumentality, rain in all its manifestations, surreal animal life, and a poetic vision of reality. Step into this waking dream to an imaginary Mexico, timeless and universal, where light quenches the spirit and rain ignites the soul.